Goldman Sachs Group Inc. Chief Executive Officer Lloyd Blankfein said he sees a few terrific aspects to the prospect of President-elect Donald Trump asking Jamie Dimon to serve as U.S. Treasury secretary. He would be a great Treasury secretary, and he has been a terrific competitor, Blankfein said at a conference in New York on Thursday about his counterpart atop JPMorgan Chase & Co. With that one move, you would kill two birds with one stone. The joke was among many Blankfein cracked during a relaxed on-stage conversation about the U.S. election and the future of the financial industry with DealBooks Andrew Ross Sorkin. At one point, the banker shrugged off a campaign ad days ago that showed his image while Trumps voice promised to take down a global power structure that is responsible for the economic decisions that have robbed our working class. I have been in the press a lot from time to time, and that does not make my top-30 list of things I am concerned about, said Blankfein, 62. The CEO didnt criticize the president-elect. Blankfein said he never wrote off Trumps chances of winning the presidency, though it didnt seem likely. He had expected markets to be jarred, and then rise, if the Republican prevailed over Democrat Hillary Clinton. The jarring period turned out to be surprisingly short, passing in mere hours, Blankfein noted. The policies hes committed to are very market- and asset-friendly, Blankfein said. If you look at the totality of the positions he has staked out — spending on infrastructure, the military, more fiscal spending in excess of what Secretary Clinton had called for — its really no surprise. His policies are market-supportive. Shares of Goldman Sachs have climbed more than 10 percent since Tuesdays election, as investors bet Trump will roll back financial regulation. In the longer term, asset prices will depend on what kind of president Trump turns out to be, Blankfein said. He expressed doubts that Trump will make good on a promise to reinstate the Depression-era Glass-Steagall law that separated commercial banks from investment banks, before it was knocked down more than a decade ago. That omelet has been made, that toothpaste is out of the tube, Blankfein said. Earlier in the day, Blankfein told Goldman Sachs employees in a voicemail message that Trumps commitment to infrastructure and reforming government and taxes will be good for economic growth. He urged them to be sensitive to others political views and to focus on helping clients during the transition. I know that some of you may feel uncertain, or perhaps even disheartened or uncomfortable with the outcomes of these political cycles, while others of you feel just the opposite, Blankfein said in the message. Amidst the changes we expect to unfold, you should stay close to our clients. Your ideas, insights and advice will prove valuable to them as circumstances evolve in the weeks and months ahead. 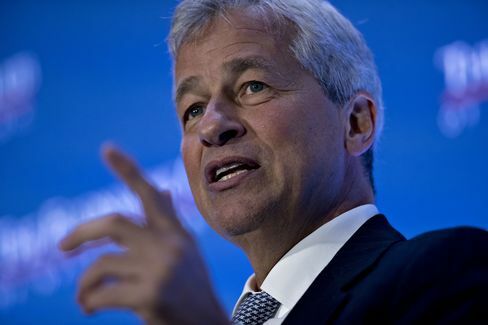 Trumps advisers have raised the possibility of naming Dimon, 60, as Treasury secretary, CNBC reported on Thursday, citing unidentified people familiar with situation. One person told the broadcaster that Dimon wouldnt be interested in the role. Dimon wasnt the only potential Treasury candidate Blankfein praised on stage. Steve Mnuchin, the Goldman Sachs alumnus who served as Trumps national finance chairman, is a very smart guy, he said. When I was running the fixed-income division, he was a high flier, reaching senior ranks quickly at a young age, Blankfein said. I have followed his career, and I know what he has done, but I havent engaged with him much since then. Asked about another former Goldmanite, who eventually became Trumps campaign CEO, Blankfein answered briefly: I have never met Steve Bannon.